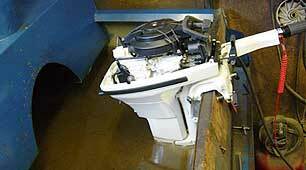 We service Evinrude outboards and MerCruiser sterndrives. 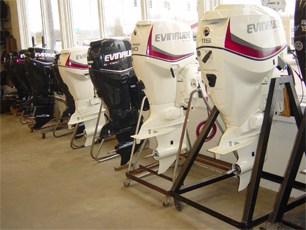 Inventory of our new Evinrude outboard motors. We have the largest inventory of Evinrude and Johnson parts in the Rochester area ranging from 1954 to present. We also have the largest inventory of OMC sterndrive parts in Western New York. In addition, we carry a large stock of MerCruiser sterndrive parts. We are a distributor of GLM after-market parts and stock most GLM exhaust manifolds, complete gearcases, water pump kits, tune-up kits, bellows kits, seal kits, shafts and bearings. We offer daily shipping on all in-stock parts. Call for parts availability and pricing at (585) 265-0750. 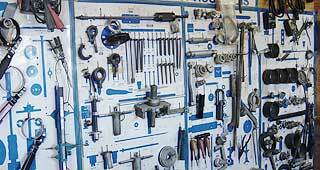 We have all the special tools to service your Evinrude outboard and MerCruiser sterndrive. Our test facilities allow us to test run every engine before it is returned to the customer.